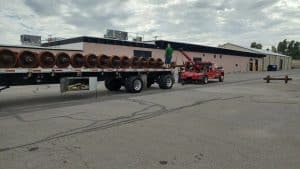 Whether from improper load securement or from a sudden evasive maneuver, sometimes tractor trailers experience load shift. 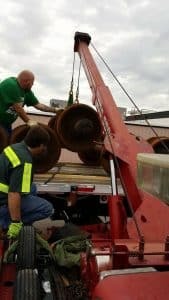 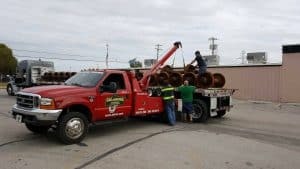 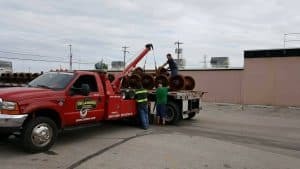 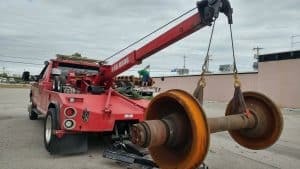 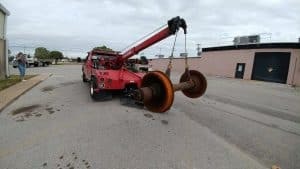 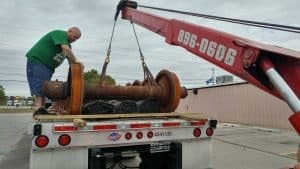 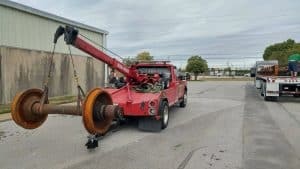 While sometimes load shifts result in loss of control and an accident, most of the time it causes an unsafe condition that can be rectified with help and the right equipment to perform a load shift recovery. 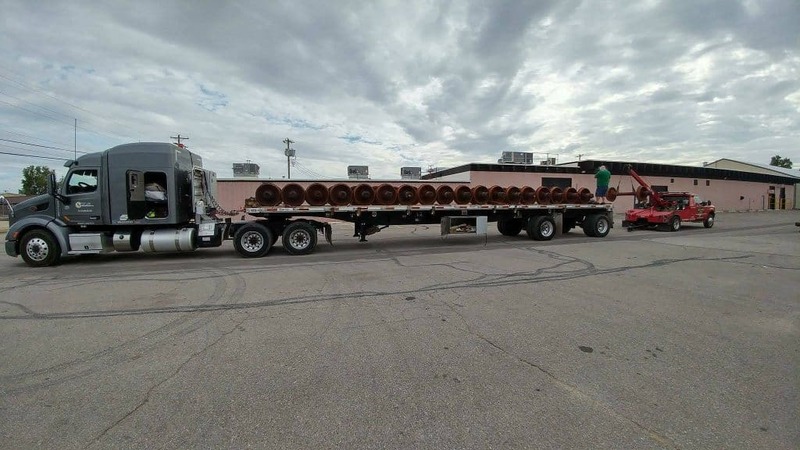 The trick is finding the right help that understands the importance of rebalancing and securing the load without damaging the freight. 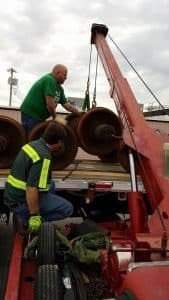 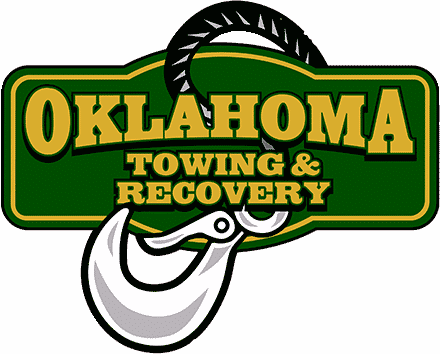 Sunday morning, we received a call from a flatbed carrier out of Missouri in need of a load shift recovery. 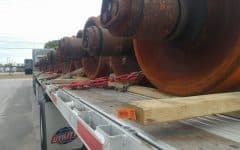 Their driver had braked aggressively to avoid an accident with a careless motorist who cut him off when he exited I-40 from the left lane, and his load of railroad car axles had shifted badly and was no longer secure. 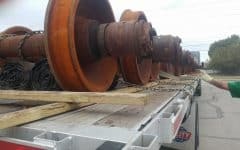 The truck driver carefully exited the freeway and found a safe place to stop. 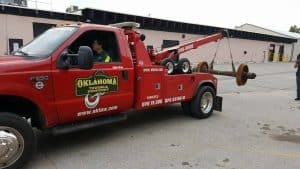 His safety department called us. 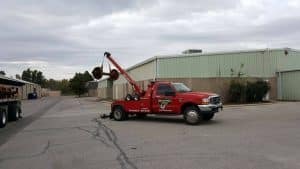 We responded with truck 3, evaluated the situation, and escorted the truck to a large open parking lot to get to work. 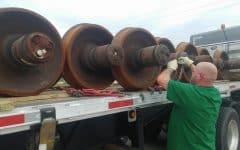 We lifted the rearmost three axles, one by one, and set them on the ground. 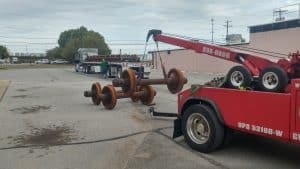 This allowed us to roll back the remaining axles, and reposition them properly one by one. 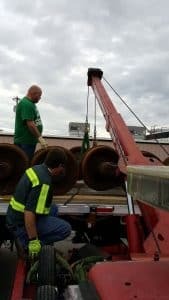 The driver assisted with rolling the loose axles, and chaining them in place as we went. 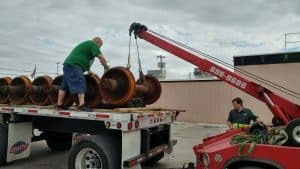 This load shift recovery took less than 3 hours to complete. 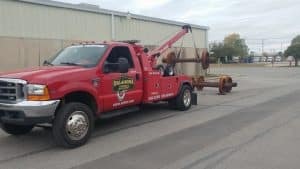 The safety director paid with a credit card, and their truck was back on the road to California with a properly secured load.